When you see a bag of sea salt caramel chips, you grab them. That was the case when I was looking for the very elusive Hershey’s Cinnamon Chips one day while in Walmart. Even though I didn’t find the cinnamon chips, I was intrigued by the sea salt caramel chips, which had a recipe on the bag. I decided to make them for our family’s Easter gathering. The recipe is simple, and as you would expect, the cookies are soft and yummy. I’m thinking they would also be a great addition to brownies. Perhaps I’ll try that next (because, of course, I bought two bags!). Last year our town’s football team were the State champs in our division. 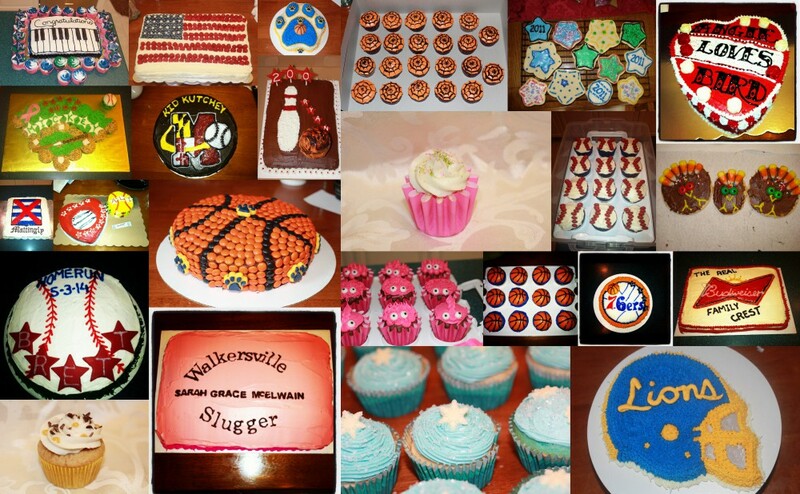 I baked a boatload of goodies for the celebratory banquet, including cakes and cookies. This year, our team won the conference title again, but was knocked out in the quarterfinal round of the playoffs on a controversial play. But it was still an amazing season. And this year, my son was selected for varsity in just his sophomore year. I decided to make a favorite chocolate sugar cookie recipe. It makes a ton of dough — and I would need it because the t-shirt cookie cutter was bigger than I anticipated. There were 25 seniors on the football team this year. With the rest of the football cookies, I added on the laces for the many siblings that would be attending the banquet. For JV, I made chocolate cupcakes with royal blue and gold foil cupcake liners and topped them with vanilla frosting. Then I dipped the tops in gold pearlized sugar sprinkles and blue sugar sprinkles, alternating the cupcake liner color with the sprinkle color. I added each players’ number on the top. For the extras, I added the football decorations. Even though back-to-back State championships weren’t in the cards for the team, congrats to the Walkersville Lions on their back-to-back Conference Championship seasons! Each year, I make goodie bags for my immediate team (6 individuals, including my supervisor). In addition, I make a variety of cookies (small cut outs of gingerbread and sugar) to share with the people on my floor. This year, the base cookie was a gingerbread cookie. I decorated one for each team member with their name, and then filled the boxes with some mini-breads, other generically decorated gingerbread and sugar cookies and a $10 Starbucks gift card. This year, my son was moved up to the high school varsity football squad in his sophomore year. It was very exciting for him, but meant a considerable shift in my photography hobby. I have been taking pictures of him for more than 7 years on the sidelines of all of his sporting events – baseball, football and basketball. The varsity team already has a photographer mom on the sidelines whose son is also a sophomore. So I was watching him from a new vantage point – the stands. Because many of the boys he had played with for years were still on the JV team, I decided to show up to those Wednesday night games and take pictures. I was able to take care of my photography fix, and share the photos with the football families. For the last game of the season, I decided to make goodie bags for all the players and coaches, and share the extra cookies with family and fans in attendance. I then stuffed cookies in treat bags and put football and gold star stickers on the packages, with a gold tie. Each coach and player received a treat bag. For the parents and fans in attendance, I had left over cookies that one of the moms helped me to hand out. Congrats to the Walkersville JV Lions on a great season, 6-2. And thanks for letting me be there to capture the action! The JV Lions players and coaches have a tradition of kneeling before their game, hands on one another, led by a player in prayer. That shadow you see in the lower left corner is me taking their picture. Editor’s note: It’s been awhile since I have posted. The Fall is always super busy with football for my kids, work projects and the start of the holiday season. Thanks for your patience as I try and catch up on sharing a bunch of baking I’ve been doing since September. Every year for the past 4 or so, I have been making cookies to send off to my friends’ kids as they leave for college. This year was no different. There were 5 kids who got care packages this year. They were big brothers of some of my oldest son’s friends, and others are my community friends’ kids. Packages went to Frostburg University (MD), McDaniel College (MD), Shepherd University (WV), and Wake Forest University (NC). The inserts were simple enough – loaves of Snickerdoodle bread and pumpkin bread, as well as chocolate chip cookies. I sent them via 2-day delivery — please don’t tell the USPS I check the box that affirms there are no perishables in the package! There’s nothing better than the feeling of community. And making the good young people you know feel loved and happy. So, what are the ways you could pay it forward for others?